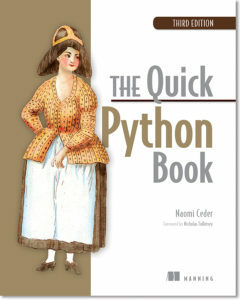 Save 37% on The Quick Python Book, Third Edition. Just enter code fccceder into the discount code box at checkout at manning.com. Understanding how list indices work makes Python much more useful. Using what you know about the len() function and list slices, how would you combine the two to get the second half of a list when you don’t know what size the list is? Experiment in the Python shell to confirm if your solution works. In general, del list[n] does the same thing as list[n:n+1] = , whereas del list[m:n] does the same thing as list[m:n] = . If remove can’t find anything to remove, it raises an error. You can catch this error using the exception-handling abilities of Python, or you can avoid the problem by using in to check for the presence of something in a list before attempting to remove it. Suppose you have a list which is ten items long. How might you move last three items from the end of the list to the beginning, keeping them in the same order?